Here's an update on my implementation of Simon and Forrest's idea. It's made from standard 15mm copper and brass plumbing components. The drill bit fits down the middle, being inserted at A. 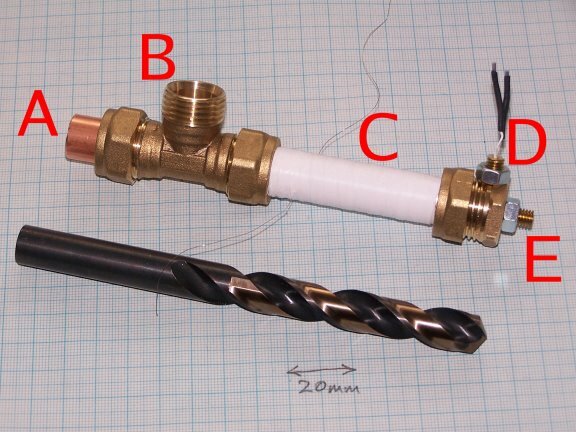 It is rotated anti-clockwise to drag Polymorph in from the feed at B and to drive it into the heated barrel C. D is a thermistor plug for temperature control, and the extruder nozzle is at E.
The design would work with any national standard plumber's compression fittings; all that's needed is that the drill bit (13 mm in mine) is about 0.5mm under the inside diameter of the pipes. The heated barrel uses nichrome heater wire insulated with PTFE tape; that will get a lot simpler when Forrest's insulated nichrome arrives here in Bath. The thermistor and nozzle can be swapped, and the end cap rotated by 180o. This allows the device to extrude axially or radially, whichever is required. An obvious improvement would be to use a reduced-shank drill (which I couldn't get quickly) and add another blank plug with a hole for the drill shank at A. That would retain the drill bit nicely in the device against the force to the left from the pressure at the nozzle. Experiments terminated now owing to a power outage! RepRappers deep in the Waitakere Rainforest who think themselves a little cut off may care to ponder that - in the country that invented electromagnetic induction, and but 30 kilometres from the remains of a civilisation that antedates the pyramids - the bloody electricity company can't keep pumping electrons down the wires in a reliable manner. I'm going to go with Vik's idea of an electric screwdriver to start with. If it all works, I'll RP a frame+motor mount. That as they say in Liverpool, looks boss. I was looking at that design. Using those components, if you needed to put a chunk of PTFE pipe between the extruder head and the pump barrel you should be able to use those same kind of grip fittings and just extend the length of it a bit. That is WAY cool! As to the power outage. Every time it rains or blows around here there's a better than even chance that we'll lose power on a neighborhood or community-wide basis. You'd think of a state that likes to think of itself as the world's fourth largest economy that we'd have better electrical transmission infrastructure. Not! I'm not quite sure how far upstream we need the melt to go. Now I'm powered up again, I find that the feed tends to clog: granules just melt together at the point in the vertical feed where the temperature is about 45 C; the polymorph then drains away from under that, leaving it high and dry. This implies to me that the start of the feed needs to be cold so the polymorph is solid there, melting as it gets further down. Anyway; I'll try to set it up so that the heating is in sections and I can control the temperature of each independently. This won't be needed in the final version, I'm sure. But it'll be useful for experiments. Oh yeah, did you have to grind the pellets? Did the coffee grinder work? I suspect it may work best having a longer tube, with the plastic only melting after it has passed the drill bit. Alas, the best I have to experiment with at the moment is hot-glue, which should work well enough to replicate this experiment. Fantastic. It's a thing of beauty. I can see people using this design for repstrapping (less RP'd motor mount). IMHO I think that it's difficoult to make a system that relies on gravitation and/or vibrations to feed the drill bit on theese small scales. A 'propeller' pushing and stirring the granulate into the enterance would ensure constant filling of the scew. Would it be practical to place the drill vertically and feed where it enters the pipe attaching propellers etc to the drill? ...Thinking about using as much reprap parts as possible I wonder if it would be possible to place a piston where the drill bit is located now, extruding and loading in cycles? Screws aren't that hard to make with FDM, as long as you deposit them with the rotational axis vertical and keep the pitch at 45 degrees. I have an undergraduate project student (James Low) working on improvements to my RepRap syringe pump (see the blog for 23 March 2005) so that it has a quick-swap material cartridge, can pump anything sticky (like icing sugar...) and has an optional heater.